A side by side comparison between Brother XM2701 and XL2600I. Both are very similar in features but the price is a bit different though. Now if you ask me which one is the best sewing machine to buy under $100, I would have answered Brother XL2600I a year ago, but now there is a fierce competitor in XM2701 to dethrone it. Both these machines are aimed at beginners. For years, there was no competition to XL2600I, but in 2014 Brother released the XM2701 which has already started eating away the market share of XL2600I. XM2701 is not a huge step up from XL2600I, still there are some slight changes in features. There is a difference in price as well, you need spend few more dollars to get XM2701. Especially in the under $100 price category, the price gap is quite significant, so you must decide which machine suits your requirement and budget. At first we will have a look at the main areas where these two machines differ in features. 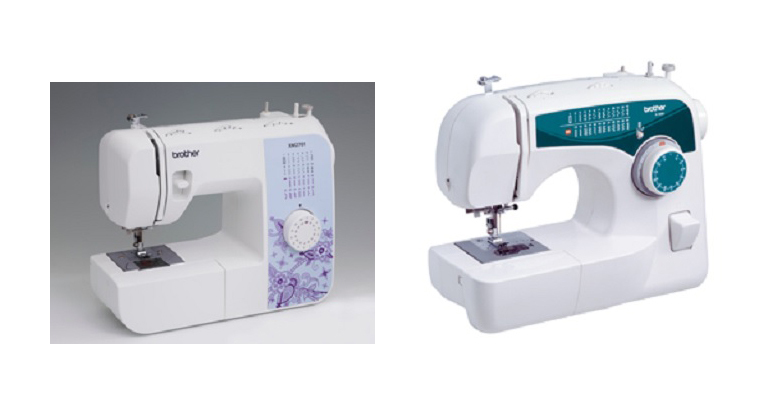 Both are mechanical sewing machines but their design is not identical. XL2600I resembles CS6000i in design (which is the best sewing machine in the under $200 category) whereas XM2701 is more like the CS5055PRW. Built-in Stitches : This is the main difference between XM2701 and XL2600I. XM2701 has its nose slightly in front here as it comes with 27 built-in stitches when compared to 25 built-in stitches of XL2600I. Both machines come with a one-step buttonhole as well. I really don’t think the difference of two extra stitches will matter much. It is pretty much even steven here. Machine Weight : XM2701 is slightly heavier than XL2600I (1.6 lbs to be exact). Now this must add more stability to XM2701. Less vibrations will be there, especially when sewing at high speeds. Accessory Feet : XM2701 wins here with 6 included sewing feet, whereas XL2600I comes with only 5. You will get a zigzag foot as an additional accessory with XM2701. That’s it, the difference ends here. Now let us have a side by side comparison of the two machines. XM2701 is literally the upgraded version of XL2600I. The motor and parts inside both the machines are identical, the only difference is in the design. So you must expect no difference in performance. Honestly, these two are the best performing sewing machines you can get for under $100. Go for XM2701, if those 2 extra stitches matter a lot to you and for slightly improved stability. Go for XL2600I, if you are under a tight budget. Currently, there is a considerable price difference between these two machines. Always compare the prices before you buy. I would consider XL2600I as a better option if it is $15 or more cheaper than XM2701.